Important examples include the metabolic network of 43 organisms,43 the protein interaction network of S. cerevisiae42 and various food webs.51 If the degree distribution instead was single-peaked (e.g., Poisson or Gaussian) as in Figure IB, the majority of the nodes would be well described by the average degree, and hence the notion of a "typical" node. In contrast for networks with a power-law degree distribution, the majority of the nodes have only one or two neighbors while coexisting with many nodes with hundreds and some even with thousands of neighbors. 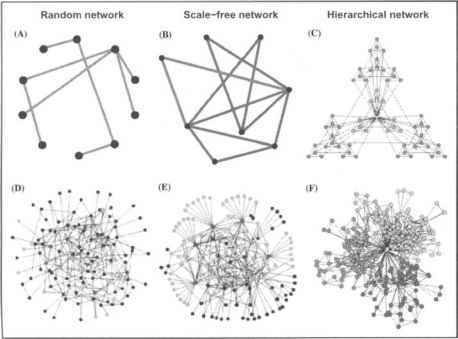 For these networks there exists no typical node, and they are therefore often referred to as "scale-free". An important question now arises—we can characterize networks using the above mentioned quantities, but why is the power law behavior so pervasive? Several models building on very different principles are able to explain these observed features. Figure 3. Graphical representation of three network models: A,D) The ER (random) model, B,E) the BA (scale-free) model and (C) and (F) the hierarchical model. The random network model is constructed by starting from ./V nodes before the possible node-pairs are connected with probability p. Panel (A) shows a particular realization of the ER model with 10 nodes and connection probability p = 0.2. In panel (B) we show the scale-free model at time t (green links) and at time (t + 1) when we have added a new node (red links) using the preferential attachment probability (see Eq. (4)). Panel (C) demonstrates the iterative construction of a hierarchical network, starting from a fully connected cluster of four nodes (blue). This cluster is then copied three times (green) while connecting the peripheral nodes of the replicas to the central node of the starting cluster. By once more repeating this replication and connection process (red nodes), we end up with a 64-node scale-free hierarchical network. In panel (D) we display a larger version of the random network, and it is evident that most nodes have approximately the same number of links. For the scale-free model, (E) the network is clearly inhomogeneous: while the majority of nodes has one or two links, a few nodes have a large number of links. We emphasize this by coloring the five nodes with the highest number of links red and their first neighbors green. While in the random network only 27% of the nodes are reached by the five most connected nodes, we reach more than 60% of the nodes in the scale-free network, demonstrating the key role played by the hubs. Note that the networks in (D) and (E) consist of the same number of nodes and links. 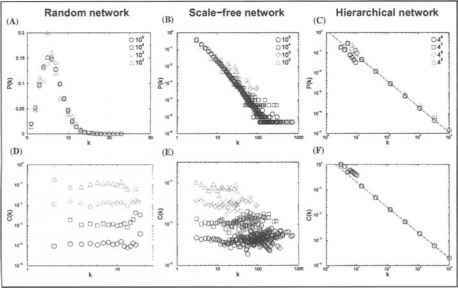 Panel (F) demonstrates that the standard clustering algorithms are not that successful in uncovering the modular structure of a scale-free hierarchical network. A color version of this figure is available online at http://www.Eurekah.com. Figure 4. Properties of the three network models. A) The ER model sports a Poisson degree distribution P(k) (the probability that a randomly selected node has exactly k links) which is strongly peaked at the average degree (k ) and decays exponentially for large k. The degree distributions for the scale-free (B) and the hierarchical (C) network models do not have a peak, they instead decay according to the power-law P(k) - k "1. The average clustering coefficient for nodes with exactly k neighbors, C(k), is independent of k for both the ER (D) and the scale-free (E) network model. F) In contrast, C(k) - k~l for the hierarchical network model (cf. Fig. 2). model, the clustering is independent of the node degree k (Fig. 4D). As we have just seen in Figure 2, the ER model does not capture the properties of biological networks. The simultaneous combination of these two network growth rules gives rise to the observed power-law degree distribution (Fig. 4B). In panel 3B, we illustrate the growth process of the scale-free model by displaying a network at time t (green links) and then at time (t + 1), when we have added a new node (red links) using the preferential attachment probability. Compared to random networks, the probability that a node is highly connected is statistically significant in scale-free networks. Consequently, many network properties are determined by a relatively small number of highly connected nodes, often called "hubs". To make the effect of the hubs on the network structure visible, we have colored the five nodes with largest degrees red in Figure 3D,E and their nearest neighbors green. While in the ER network only 27% of the nodes are reached by the five most connected ones, we reach more than 60% of the nodes in the scale-free network, demonstrating the key role played by the hubs. Another consequence of the hub's dominance of the network topology is that scale-free networks are highly tolerant of random failures (perturbations) while being extremely sensitive to targeted attacks.3 Comparing the properties of the BA network model with those of the ER model, we note that the clustering of the BA network is larger, however C(k)is approximately constant (Fig. 4E), indicating the absence of a hierarchical structure. Many real networks are expected to be fundamentally modular, meaning that the network can be seamlessly partitioned into a collection of modules where each module performs an identifiable task, separable from the function(s) of other modules.33'34'37,46'55,60 Therefore, we must reconcile the scale-free property with potential modularity. In order to account for the modularity as reflected in the power-law behavior of Figure 2B and a simultaneous scale-free degree distribution Figure 2A, we have to assume that clusters combine in an iterative manner, generating a hierarchical network.56,63 Such a network emerges from a repeated duplication and integration process of clustered nodes,56 which in principle can be repeated indefinitely. This process is depicted in panel 3c, where we start from a small cluster of four densely linked nodes (blue). We next generate three replicas of this hypothetical initial module (green) and connect the three external nodes of the replicated clusters to the central node of the old cluster, thus obtaining a large 16-node module. Subsequently, we again generate three replicas of this 16-node module (red), and connect the 16 peripheral nodes to the central node of the old module, obtaining a new module of 64 nodes. This hierarchical network model seamlessly integrates a scale-free topology with an inherent modular structure by generating a network that has a power law degree distribution (Fig. 4C) with degree exponent y= 1 + In4/ln3 = 2.26 and a clustering coefficient C(k) which proves to be dependent on k'1 (Fig. 4F). 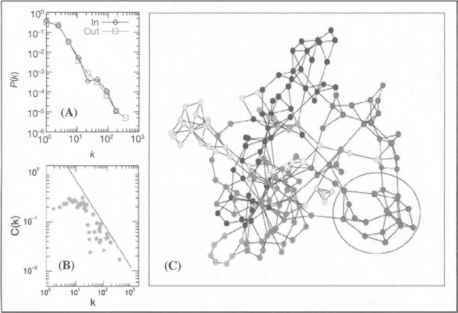 However, note that modularity does not imply clear-cut sub-networks linked in well-defined ways.36,56 In fact, the boundaries of modules are often blurred (see Fig. 3F), bridged by highly connected nodes which interconnect modules. How k d interaction followPoisson's distribution?